Alternative Gift Fairs promote the gift-giving tradition of the holiday season without the wastefulness and commercialization of conventional shopping. Alternative gifts prioritize meaning over materials — they may include charitable donations, gently-used secondhand items, help for a community project, and more. Whether for a few dozen or a few hundred people, Alternative Gift Fairs are a fun and inspiring way to celebrate the holidays! Alternative Gift Fairs provides critical support for a diverse collection of community organizations whose work has local, national, and international reach. An alternative gift is a gift that is given to someone in need, in lieu of spending money on items that your friends and family probably do not need. Gifts in the past have ranged from $5 to give a compact fluorescent light bulb to a local, rural household; $10 for a week of school, clothing and two meals a day for an orphan in Zambia; to $100 for a “Golden Opportunity” scholarship fund to help students remain successful in area schools. 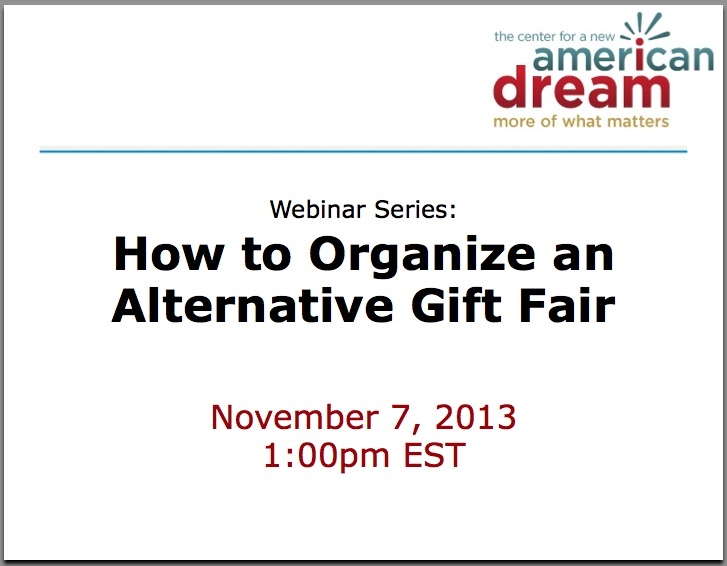 Join New Dream on Thursday Nov 7th, 2013 for a free webinar about how to organize an Alternative Gift Fair in your community. The webinar will cover topics such as how to get started, obtaining funding and participants, and advice on how to publicize your event. Get inspired and hear directly from the organizers of successful and established Alternative Gift Fairs. Here are some event pages you can check out yourself! The Webinar was recorded and is available for you to view at your convenience. If you couldn’t participate in the “live” presentation, this is the next best thing! The recording includes the helpful “Q&A” at the end of the session, has excellent sound quality, is one hour long, and is very informative! You don’t have to be thinking about a “community-level” event for this to be of help to you. The concepts covered are great from organization-level events as well such as a church congregation, a fraternity/sorority, a small-medium business, etc. This entry was posted in Community, Meeting / Webinar. Bookmark the permalink.